Ramsey Campbell is a multi-award-winning English writer who has focused on the horror genre. His novels include The Hungry Moon, Silent Children and this year’s Way of the Worm. Next year sees the publication of The Wise Friend. Lately, he has also lent his editing skills to The Folio Society’s The Folio Book of Horror Stories, for which he also provides an introduction, and which has been released in time for Hallowe’en. Is Hallowe’en or Christmas the best time of year for terrifying tales? Either, and every other time of year as well. If that’s too general an answer, I’d say Christmas might be the best time for reading them aloud – there’s a great tradition of that – while Halloween may be ideal for reading them by yourself. At least, you might like to hope you’re by yourself, but what’s that face that seems determined to look in at your window although the autumn wind is tearing holes in it? What does the best horror fiction offer the reader? It depends on the kind of tale. Some convey uncanny dread, others plumb the depths of human psychology, than which there is no darker place. Some shine a strange illumination on everyday life and the way we live now, while others evoke the utterly alien. The finest, at least in my view, reaches for awe, to which it rises through terror. I’m still trying to achieve that myself. You say crawling through a transom as a teenager gave you the inspiration for ‘Again’ – but where did the idea of the old woman come from? From deeper in my mind than I can identify unless she was peering over my shoulder as I wrote. You specify Wirral Way and the Liverpool parks at the start of ‘Again’ – how important was a familiar location when you were developing it? Familiar places are crucial to much of my stuff, though here, as you say, it was simply a setting not too remote from a well-travelled route (even if it feels to our unlucky protagonist as though it is). The setting didn’t generate the story in this case, but in many of my tales it does, all the way back to ‘The Cellars’ from 1965, which grew out of a real subterranean location in Liverpool city centre. Often, I’m trying to convey the eeriness of a real place – the landlocked fishing village of Parkgate in ‘The Ferries’, for example, or the blitzed fifties suburbs of Liverpool in The Searching Dead, or the Merseyside underground railway in Creatures of the Pool. The story was published in 1981 – do you recall what else you were working on at around that time? It was actually one of four short stories I wrote in early 1980 – it was preceded by ‘Bedtime Story’, a tale that interweaves psychology and the spectral, ‘The Hands’, a religious nightmare, and ‘Playing the Game’, with a dockside monster invoked by a board game – and the rest of the year was occupied by ‘The Claw’, a novel about a talisman that possesses the parents of a young girl. That book needed quite a bit of revision and recasting, but the end result wasn’t too bad, I think. By the time ‘Again’ appeared I was working on ‘Incarnate’, a new novel that occupied me for eighteen months. Besides your own, do you have a favourite story in the Folio Society anthology, and if so, which one? Lord, mine is nowhere near my favourite, but the book contains what may very well be my absolute favourite in the field – Arthur Machen’s ‘The White People’, where the young girl’s journal that forms the centre of the story I find as insidiously disturbing, indeed terrifying, as any of the films of David Lynch. Your introduction comments on the connections between the authors chosen for this collection. Which of them have influenced your own work the most? I was greatly influenced by Lovecraft in my earliest published stories, but after that I rediscovered M. R. James and his genius for the dreadfully suggestive phrase or sentence. I think the greatest influence on the way I came to write in later years was Fritz Leiber, with the very tale I included, ‘Smoke Ghost’. Its sense of the big city as the source rather than just the setting of the supernatural opened my eyes wide to how I wanted to develop as a writer. Are there any common human fears, or your own specific fears, that you’ve yet to write about but would like to? Not that come to mind, but my fears do recur in the tales… Gullibility. The vulnerability of children. The increasing reluctance of people to intervene when they see or suspect wrongdoing. The espousal of beliefs that deny the right to question. The growth of fundamentalism, which means more and worse of the previous trait. The willingness of the mass (which may well mean all of us) to find scapegoats. The growth of the notion that literacy and other standards are less important than they used to be. Are there any stories or authors that nearly made the collection that you think horror readers should know about? Many of them. I could easily have filled an anthology twice the size, but I appreciate costings precluded that. ‘The Monkey’s Paw’ is a sterling tale that has lent its structure to much that comes later. The darkly luminous stories of Marjorie Bowen might have yielded a contribution, and Elizabeth Bowen’s ‘The Demon Lover’ finds the ghostly in blitzed London. Ray Bradbury could have given us ‘Skeleton’, a truly original bit of grisliness, or ‘The Veldt’, where horror lurks in science fiction. John Collier’s imagination was as capacious a cornucopia, and perhaps ‘Bird of Prey’ would have flown into the book. Robert Aickman disliked horror as a genre, so he often maintained, but certainly enriched it with his work – ‘Ringing the Changes’, feted by critics on BBC radio, and which is a great tale of terror. He and Elizabeth Jane Howard travelled the canals, an experience from which she derived her fearful tale ‘Three Miles Up’. So many other possibilities, but the one which I should have substituted for my own tale (invited by my editor, but that’s not enough of an excuse) is Alison Flood’s ‘Eastmouth’, a perfect gem of understated terror. It can be found in more than one recent anthology and is very well worth seeking out. Indeed, I hope the omissions I’ve cited may act as a list for further reading. What did you think of the final design for the book, and how important is an aesthetic appeal? I think the book looks splendid – elegantly menacing before you’ve even opened it, and the interior illustrations are a dark delight. I believe beauty and horror can coexist and enrich each other, and this volume is a fine piece of evidence. 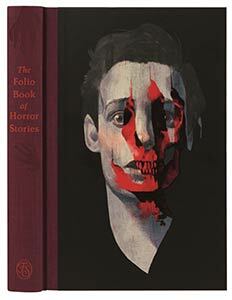 The Folio Society’s The Folio Book of Horror Stories, edited and introduced by Ramsey Campbell, illustrated by Corey Brickley, is available exclusively from The Folio Society.